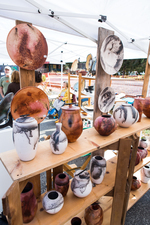 The 12th Annual WNC Pottery Festival returns to the Western North Carolina town of Dillsboro on November 5 from 10 a.m. to 4 p.m. Named one of the “Top 20 Southeast Arts Events” in 2015 by the Southeast Tourism Society, registration for this year’s event quickly filled, promising attendees top-tier craftsmanship from 42 master potters. In this juried event, all potters compete for slots and this year welcomes 26 returning potters and 16 first-timers. Dillsboro’s Front Street will be lined with tents that showcase some of the best handmade pottery in the country. Every 30 minutes throughout the day, visitors can watch throwing and firing demonstrations by some of the participating potters. Among the demos will be this year’s featured potter, Mark Skudlarek of Cambridge Wood-Fire Pottery in Wisconsin. His functional wood-fired pottery is inspired by the shapes and practices of Asian and European folk pottery.Also, McKee will display his decorative line of functional horsehair pots, colored with an eye-catching blend of red, white and black, and he will also hold demonstrations throughout the day in front of Tree House Pottery. At 2 p.m., the festival reveals the opening of a soda kiln. The unique style of pottery is fired with soda ash to make a glassy, shiny glazed surface. The fired pots will be available for sale throughout the day. Get fired up for the pottery festival on Friday, November 4, with the Clay Olympics. Potters will compete in an old-fashioned “throw down” to see who can make the largest cylinder and the widest bowl from five pounds of clay in five minutes; who can throw the best creation from two pounds of clay in two minutes while blind-folded; and a surprise event that will not be revealed to the participants until the start of the games. Visit the Clay Olympics outside of Tree House Pottery from 1 to 3 p.m. on Friday. 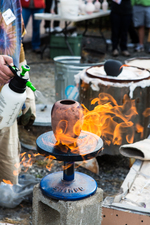 At the Clay Olympics, Village Pottery will showcase and fire up a kazegama kiln. This special kiln creates gas-fired pottery during a six-hour firing process. The completed pieces will be sold at Saturday’s silent auction, where 100 percent of the proceeds are donated to Community Table, the county’s local food pantry. 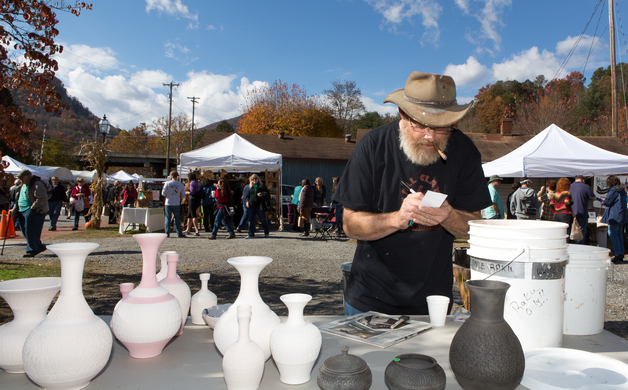 Admission to the WNC Pottery Festival is $5 per person and includes a ticket for a day-long raffle. Children under 12 are admitted free. For more information, visit www.wncpotteryfestival.com. Cashiers, Cherokee, Dillsboro, Sylva, Balsam, Cullowhee, Glenville and Sapphire are the distinct locales that make up Western North Carolina's Jackson County. Each of these Blue Ridge Mountain towns provide natural beauty that invites visitors to experience the North Carolina Mountains. Jackson County is also home to the nation’s first and only fly fishing trail, The Western North Carolina Fly Fishing Trail. The majestic mountains harbor miles of hiking trails and waterfalls while charming downtowns are known for shopping, dining, culture, and hometown atmosphere. For more information visit, www.MountainLoversNC.com. Content courtesy of the Jackson County Tourism Department Press Release.